Saving money can be easier than you might think. Budgeting and couponing don’t have to be dreary tasks. Rather, you can make it simple and fun for the whole family. Here are great tips for doing this. Draw or print out a savings chart for big, fun goals such as saving for a family vacation. You have probably seen those that look like giant thermometers with lines to represent monetary amounts or percentages. You can stick with this kind of chart or use another image. Place it in an area where the whole family can enjoy it, such as on the refrigerator. A visual representation serves as a reminder of your budgeting goal and helps everyone keep on task. Shopping online is not only convenient; it can also save you a lot of money on everything from coffee makers to appliances. Stores solicit more business by offering coupons online, which can save you on nearly anything you need or want. You can find these coupons and promo codes at sites like Discountrue. Make a special folder to bookmark links or the coupons themselves. Make sure to list them by name so that you don’t have to hunt them down. For example, you should list “sears online coupon” instead of lumping all stores together. Make coupon hunting a game with the kids. This can become a valuable teaching experience because you can show them what counts as a good coupon. For example, teach them where to find the expiration date to know if it is still valid. Each time a child brings you a valid coupon for something your household uses, that child gets a point. Tally the point up at the end of a month and whoever has the most points wins the hunt and gets an inexpensive prize. For entertainment expenses, create a large coin jar and set it on a kitchen counter. Family members add coins to it whenever they have extra, and when the jar as full everyone gets to go out for ice cream or some similar inexpensive family outing. For products your household uses often, make sure you register at the company’s website. Many send samples and coupons through the mail, and often these coupons have a greater value than those you may find in magazines or newspapers. These methods keep the subject of budgeting light-hearted and joy-filled in the home. Everyone will be happier, will learn to work together for common goals and kids will take these important lessons into adulthood. 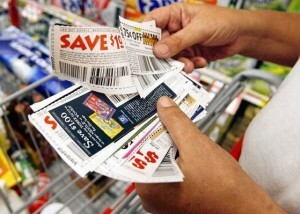 Read and enjoy The Ultimate Guide to Extreme Couponing.